Someone got a good picture of me dancing down Denman Street in Vancouver, BC. during the 2011 Gay Pride Festival. 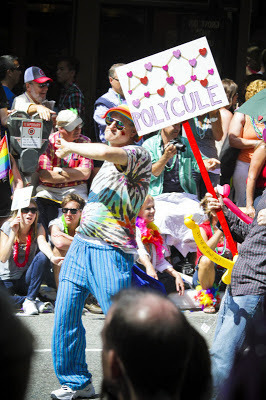 Folks from Bellingham and other places were invited to join the Vancouver Polyamory contingent in the parade. Someone else took this picture, and here is a link to the set of pictures I have from that event. Fun memories. Also, this blog entry is to link my blog title on polyamory to my flicker photos on the same subject. By the way, same parade was also fun in 2012.